Looks Yummy ! Enjoy your trip :)) Have fun Priya !! What a beautiful lassi.This is new to me,would love to try it.Enjoy your holidays. very innovative...sounds very yummy and lovely color! super cool color Priya,loved the yummy drink!! Very nice and healthy combination.. looks gr8 !! Beautiful and healthy drink Priya. The look itself is torturing me..It's a real energy booster Priya..Cheers on your trip ! Wat a beauty .. love the color.. I love the green apple soda available here in Cafe Cofee Day.. this is so refreshing..
Priya, even I can't imagine BM without you..:)..Enjoy your trips and come back with loads of stuffs to share. What a wonderful colour, love how green it looks..
Lassi with apple? Nice idea... generally i have heard mango lassi, strawberry lassi.. this is new and you made it too appealing by choosing the green apple.. The color is soooo good. Ohh I love that colour and so innovative! Happy to follow you Priya! very different and unique combo...looks delicious!!! This is really very very inventing recipe..never ever heard of this kind of Lassi,,Hat's of to you......looking very very yummy....perfect for the summer...Lovely clicks..
green apple lassi looks green and nice. 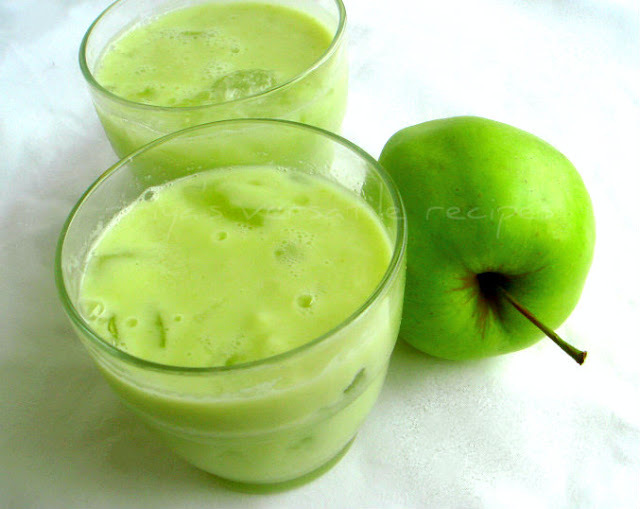 Never tried lassi with apple Priya have to try now beautiful color..
Lassi with green apple is something new.. Looks delicious and love the color..
Priya this is definitely a delicious way to include apples. Yummy! mmmm... a very unique lassi. Looks delicious. The colour is fabulous. I love this idea.